Developed after extensive study and analysis of the sense of sight, smell and taste of numerous carnivorous fish. 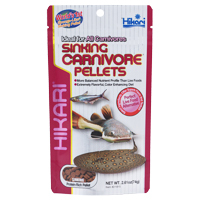 Inclusion of key ingredients like DL-methionine and Llysine allowed us to produce a food most bottom feeding carnivorous fish devour readily. New advances in bio-technology helped us identify the highest grade of carotenoid available today which promotes active color development and retention in UV deficient environments. Your pets can now look as good as you expected them to! Feed two to three times a day, but do not exceed the amount your fish will eat within a few minutes. Carnivorous fish may resist a new type of food when changing their diet, continued use will ensure acceptance. Care should be taken to avoid over-feeding and always remove uneaten food after feeding period.